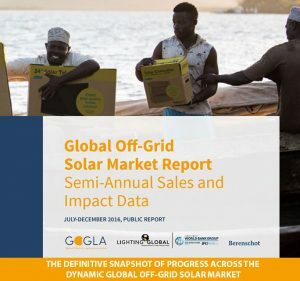 Lighting Global, the World Bank Group’s platform to support sustainable growth of the international off-grid solar market, and GOGLA, the Global Off-Grid Lighting Association, launched the latest Global Off-Grid Solar Market Report, which includes performance data from 55 companies and covers the period of July to December 2016. This latest publication builds on the previous two reports (H2-2015 and H1-2016), and is the third in a series of six-month market updates co-produced by Lighting Global and GOGLA that track the swiftly evolving market for modern, clean, and affordable off-grid solar energy products worldwide. In addition to key sales figures across a range of product categories, the report also looks at important market drivers and other influencing factors—including climate, currency devaluation and market concentration—to knit together a complete picture of the latest results and current environment.